SQL Monitor 9 brings you a seamless overview of your entire SQL Server estate, enabling you to monitor, maintain, and report on the health of your estate. Estate management lets you monitor your estate across four new views: Installed Versions, Disk Usage, Backups, and SQL Agent Jobs. Found under the Estate tab, each provides a new way to track important metrics across large or growing estates without eating away at your time or the quality of your monitoring. This means you can monitor all locations accurately from one SQL Monitor dashboard without bandwidth or security being compromised. You can group these locations however you want, and they can be easily scaled (one base monitor can comfortably cover up to 200 servers). To keep track of your growing estate, simply add more base monitors. By regularly checking these views alongside alerts SQL Monitor can give you confidence and clarity when maintaining your estate’s operation and security. Identify the current versions for each of your servers. An overview of all servers above gives an instant breakdown, with further information on a server-by-server basis below, including any new SQL Server updates and when mainstream support will end. Servers will be flagged by SQL Monitor and a link to the latest available update to SQL Server provided inside the client to help you update as soon as possible. The information in this view will help you ensure you're up to date with the latest feature and security fixes while also aiding your patch and upgrade cycle. Discover changes in your disk usage on an estate or individual server basis. You'll be able to identify unusual changes in disk usage and use trend lines to predict expected disk usage for all your servers. 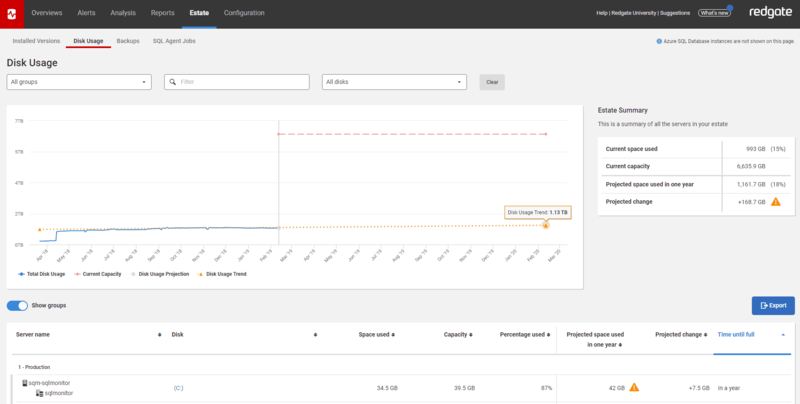 With this you'll be able to effectively report on disk usage and plan for any capacity or database changes needed. Ensure your information is recoverable, with an overview of backups taken across your estate. For each database, you can find a history of when each backup was taken, the time taken, size of the backup, type of backup, and location. You can also find out the recovery model and worst recovery point objective in the last 30 days for each database, telling you how much data you stand to lose if recovery becomes necessary. This robust history for each database will allow issues to be identified and investigated, and provides a convenient paper trail for auditing and compliance reporting. Check for issues by showing all jobs that have run in the specified timeframe along with their status. A summary graph for the previous day, week, or month showing number of successful and failed jobs, gives you an overall success rate. Drill down on a job-by-job basis to see when jobs are next due to run, along with a history of past successes and failures, with the reason for any failures that you can investigate. SQL Server estates can have a significant number of jobs running across even a single day, so an overview is a must to ensure that everything is running smoothly and any issues are found and resolved quickly. With full support for Azure SQL Databases, Microsoft's DBPaaS (Platform as a Service) solution, you can now monitor and manage your on-premise, cloud, or hybrid estates, all from within one dashboard. Get an overview of your estate by looking at on-premise and cloud servers together, or drill down on separate servers for a more detailed breakdown. If you use cloud database hosting, as well as on premises or virtual machines, you can keep all your servers together for high level work such as general monitoring or reporting while still being able to manage and investigate more specialized metrics for different server types. To help you get started when monitoring cloud servers, SQL Monitor 9 comes with 14 new alerts and 36 new metrics for Azure SQL Databases out of the box, alongside custom metrics support for your more specific needs. We typically release updates for SQL Monitor every two weeks. These include fixes and new features. You can find the release notes on our documentation site. The easiest way to stay up to date is to look out for the banner that appears at the top of SQL Monitor when an update is available. But, if you're running SQL Monitor on an environment without internet access, we can notify you by email whenever a new release is available. Just enter your details to the right, and we'll let you know as soon as a new version is available.